As mentioned in the earlier blogpost, Lake Superior dominates the Twin Ports landscape. 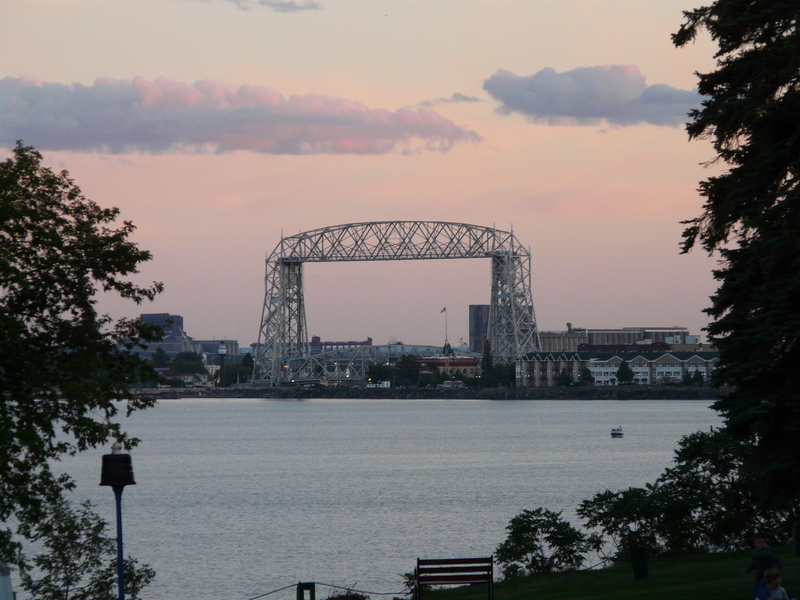 One of the most defining landmarks in Duluth is the Areal Lift Bridge. The ships that come into and leave the harbor have to pass under the bridge (unless they go through the Superior entry, and those photos will be posted another day). On summer days, Canal Park, at the base of the Areal Lift Bridge is full of people watching the ships – some big “lakers,” bulk carriers mostly over 730 feet with wide bows , and “salties,” the ocean-going ships that are shorter and taller in the middle with more narrow bows. One of the most familiar sounds is the Captain’s Salute – one long blast, followed by two short – it’s how the captains of the ships and the bridge greet each other. Areal Lift Bridge, Duluth, from the Lakewalk. Here is a little bit of sound from Canal Park. Hat tip – Perfect Duluth Day. This entry was posted in Uncategorized on April 26, 2013 by katiecwilliams. In our last post, Andrew talked about how community is reflected in the stories about New Haven. I’ll talk about how the Twin Ports of Duluth-Superior on Lake Superior are reflected in the books we’ve chosen. Duluth-Superior is the largest port on the Great Lakes. Located at the far western-end of the Lakes, coal, grain, sugar beets and taconite are shipped from the port. The East End of Duluth, along the shore of the Big Lake, is the location of the historic mansions of the titans of the turn-of-the-century industries – iron and timber. The St. Louis River was once lined with sawmills and choked with logs. Fishing has also always played a big part of the economy and culture. The Twin Ports are very connected to nature and very dependent on their natural resources. The Ojibwe settled at the west end of Lake Superior, where food grows on the water (wild rice). I drive to Duluth-Superior quite often from Milwaukee. Once you get north of Eau Claire, there are a lot of trees and not a lot of people. After driving about 2.5 hours on US 53, you go over a big hill before getting to US 2. On that big hill, you see Lake Superior spread out before you and a cities in the distance. This picture of the Twin Ports…on the edge of the wilderness where Lake Superior dominates the landscape is reflected in the literature. The themes that come up over and over again in the books set in the Twin Ports are isolation and the power of Lake Superior. Gitchi Gumi (Big Lake) is so big and ever-present that she often is a character in the stories. She provides food, transportation and jobs for those who live near her. The climate is harsh and her moods change, which contributes to her mystery and power. The experience of living on Lake Superior is so unique, that it is difficult to describe. For example, in the last two weeks, in the last half of April, there have been three snowstorms, with some locations getting 2.5 feet of snow. The stories help give a glimpse into the isolation of living in such a unique place, but also the spirit and resilience of the community that has developed. This entry was posted in Uncategorized on April 24, 2013 by katiecwilliams.